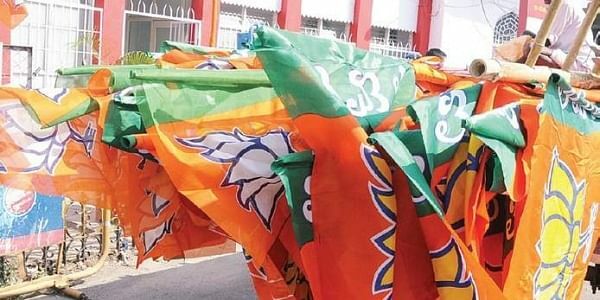 The Congress and the AAP hit out at the BJP today after the saffron party's seven Lok Sabha members did not turn up for the civic bodies' joint session on the sealing issue. NEW DELHI: The Congress and the AAP hit out at the BJP today after the saffron party's seven Lok Sabha members, nominated to the civic bodies in Delhi, did not turn up for the civic bodies' joint session on the sealing issue. Delhi has seven Lok Sabha constituencies and the MPs representing these seats become nominated members in the respective corporations, depending upon which area it falls in. "A joint session was today called to discuss the pressing issue of the ongoing sealing, but, none of the MPs attended it," Leader of Opposition (AAP) in North Delhi Municipal Corporation (NDMC), Rakesh Kumar, said, in the House. "They should have been here and listened to voices of the representatives of the people, the problems that traders are facing. BJP creates just big noise," he said, triggering protests from BJP members. The seven MPs from Delhi are -- Harsh Vardhan (Chandni Chowk), Manoj Tiwari (North-East Delhi), Maheish Girri (East Delhi), Meenakshi Lekhi (New Delhi), Udit Raj (North West Delhi), Parvesh Verma (West Delhi) and Ramesh Bidhuri (South Delhi). On January 25, it was Tiwari, who had, at a press conference, announced that a joint session of the three civic bodies -- North, South and East corporations (NDMC, SDMC and EDMC) would be held on the ongoing sealing drive. Civic bodies in north, south and central Delhi have been carrying out the drives against properties in market places, which started late last month, at the instance of a Supreme Court-appointed monitoring committee. The joint session itself was rocked by protests by AAP and BJP members in the beginning and towards the end of the proceedings. The three mayors -- Kamaljeet Sehrawat (SDMC), Preety Agarwal (NDMC) and Neema Bhagat (EDMC), later also held a joint press conference. Sehrawat, when asked about party MPs not attending the session, sought to defend the lawmakers, saying, "It was not the subject, needing presence of the MPs today. All MPs have raised the matter. The session of Parliament begins from January 29, and we are sure our MPs will seek to highlight this issue." Leader of Congress in NDMC, Mukesh Goel, later addressed reporters and alleged the problem was wrought in by the BJPruled corporations only. "From 2007, first the unified MCD, and from 2012 onwards, the three corporations, have failed to check unauthorised constructions, which has led to the present mess," he alleged. Goel, when asked about Sehrawat's response on absence of MPs in the House, said, "I condemn this. How can someone defend the absence of MPs, when the issue is of such critical importance." Meanwhile, the Confederation of All India Traders (CAIT) today gave a call for a 'Delhi Traders Bandh' on February 2 and 3, days after it held a day-long bandh here over the sealing issue. The decision was taken after a meeting held at the Constitution Club, here, which was attended by representatives of several prominent trade associations from all parts of Delhi, the CAIT said in a statement.